I thought that the Swedish trip was a trip of a life time. The best part was when me, Luke and Emma jumped off the highest diving board into the freezzzzzzing water. It was so cold but it was still fun. The school where we stayed looked amazing because about a year and a bit ago the main school building got demolished and a new school was built. The most boring part was the minibus journey up to London Heathrow airport. If I got asked again I definitely would love to go. This entry was posted in Class 10, Comenius, Uncategorized on May 26, 2012 by bosvigo. The Sweden trip was really good because the school looked amazing and the play area was just awesome!! The best part was when me, Dom and Emma jumped off all of the platforms on the diving board and the Lewannick teacher Mr. Toe went straight of the highest platform (it was really cool). It was definitely one of the best trips ever and I would do it again if I got asked. It is now exactly 2pm and our Olympic Games has come to an end. We’ve been blessed with amazing weather and Hallenskolan has been extremely welcoming hosts. For the Olympics we were divided into 16 teams, with our children representing Team GB, USA, Sweden and Germany. The children took part in a number of events including a tug of war, relays, frisbee, a blindfold challenge, a penalty shootout and a team long jump. Bosvigo looked tired but enjoyed the competition, especially the hot dogs and flapjacks! After the Olympics we were given a tour of the school and couldn’t quite believe how much space the children have here, as well as the incredible DT resources, including bench drills, jigsaws and sanders. Mr Wallis was particularly impressed! We are now resting before venturing into Gothenburg for some sight seeing, ice cream sampling and souvenir shopping. We are hoping to visit a Swedish restaurant for tea (although most of the restaurants are Chinese, Japanese or Indian) and then visit the local lake on our way home. This entry was posted in Class 10, Comenius, Uncategorized on May 22, 2012 by bosvigo. We’ve created another movie to share our experiences with you. Hopefully the children will blog themselves later, but after a day walking around in the heat (28 degrees) they are pretty tired and taking the chance to recharge their batteries before tomorrow’s sports day. This entry was posted in Class 10, Comenius, Uncategorized on May 21, 2012 by bosvigo. Another good night’s sleep and an early start. We left school at 9am and caught the train to Gothenburg. We have just begun our tour of the enormous Universeum, starting with the Swedish wildlife section. Up next is the aquarium. We’ve now made our way to the CSI room, where we’ve learned a few forensic investigation techniques. We’ve also had a go at being witnesses to a kidnap and failed dismally. Reece was very taken by the police car and fortunately preferred the front seat to the back! An early start to the day. We caught a public bus to the school at 8.20am and after a short journey arrived at Buchenbrandschule to be greeted by 120 children. They sang us a welcome song, Hello by the Beatles, then we sang our song, Hey My Name is Joe! The children really enjoyed the button actions! After the assembly the children went to class. Our children did French and team building activities – they said it was great fun and they have made lots of friends. We had a lovely lunch at the college then caught another bus and journeyed up the mountains to the Belchen, the highest mountain in the area at 1415m. We caught a cable car to the top and did some more sledging before walking to the peak. It was a tough walk, but the views were stunning and after walking, slipping and sliding back down the path we are all sat in the warmth with a hot chocolate. Not a bad way to spend a day! 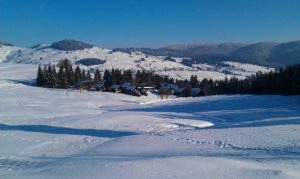 This entry was posted in Comenius, Uncategorized on February 6, 2012 by bosvigo. Super Sledging in the Silky Soft Snow! Check out our alliteration Ms Yates! The mountain was steep and at first only Percy had a go (along with Miss Robinson, Mrs Critchley and Mr Wallis), but after a while we all got involved and we loved it! We think that Wesley was the best sledger, but Zac was also really good. We had lots of fun and the crashes were just as exciting. No broken bones! 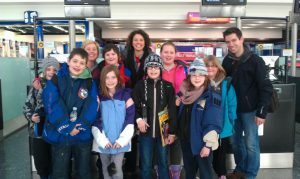 We’ve just had lunch (German sausage of course) and are ready to go snow tubing again. We all think this is an amazing place and hopefully we’ll be able to show you the views later. Very cold but we’ve all still got our fingers and toes… We just can’t feel them! This entry was posted in Comenius, Uncategorized on February 5, 2012 by bosvigo. Up in the mountains and it’s -15! Everyone has had a go at tyre sledging (very fun) and now we’re watching the mad huskies racing. Short post due to freezing cold fingers! We’ve had a great flight. Wesley couldn’t believe how beautiful the world looks above the sky and soon forgot his fear of heights. 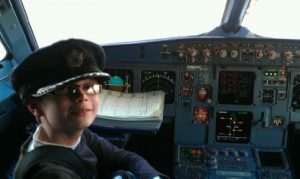 The BA crew were fantastic and the pilot invited the children into the cockpit when we landed. Percy looked pretty convincing in the pilot’s seat! We’re now on a coach to Schonau with our friends from Lewannick and should be there soon. Looking forward to German tea and playing in the snow! This entry was posted in Comenius, Uncategorized on February 4, 2012 by bosvigo. Passports? Check! Tickets? Check! Minibus keys? No – they’re at Mr Wallis’s house! Well done Mrs Critchley for finding the spare! A safe journey up and we’re now at Terminal 5 Heathrow Airport. Bags checked in and we’re ready to board. Auf weidersen!